Every once in a while comes another film which claims it understands that lost era of life called the twenties. Attempting to show how for a decade a whole generation can feel lost, these films are often over-hyped and inaccurate. In his debut feature however, Zach Braff is able to fix this with a superb film about that era of our lives when we never really know where we're going. At the age of 29, Braff, best known for his role as J.D. in "Scrubs" is well aware of how we can get lost in an age where we continue to put off our futures whilst we spend our times on different types of drug. Speaking in a recent interview for UGC Unlimited Magazine (Dec - Jan issue), Braff said: "I think your teen years are your body's puberty and your twenties are your mind's puberty." Whether Braff is right in his views or not, in his written and directorial debut, all his characters find themselves going nowhere in life. Braff plays Andrew Largeman, an actor in Los Angeles. On medication since the age of ten, "Large" has been numb for as long as he can remember. Therefore when his estranged father (Ian Holm) rings with the news of his mothers death, the original reaction is far from reactive. Returning home for the first time in almost a decade however, he decides to skip his medication for once and go on a holiday from himself. As his body detoxifies, "Large" encounters his old school friends and the bouncy Sam (Natalie Portman) and begins to question whether the prescribed drugs were actually good for him or not. "Garden State" is a brilliant first step for Braff. With characters who all suffer and to a degree feel lost, the characterisation is wonderful and the bond which the audience develops is huge. We all care for Braff's main character as he begins to finally experience life, and we all associate with Sam and Large's best friend Mark (Peter Sarsgaard). All three characters have to one degree or another suffered as a result of their parents, and we can all sympathies with that combination of embarrassment and love. The plot as well is superb in it's detail. Starting with some good laughs at the start which do dwindle in number towards the end, the story keeps us gripped and involved. Whilst it does collapse towards the end as Braff writes a conclusion containing a few too many conventions, the script never relents from keeping us in touch with the characters. Perhaps one of the finest things about this film is it's soundtrack. Created by Braff as well, this soundtrack has been nominated for awards and was at least partly responsible for convincing Natalie Portman to take the role of Sam. With the right sort of beat at the right moments, Braff's soundtrack adds to the joy of the film and makes it even more something for him to be proud of. 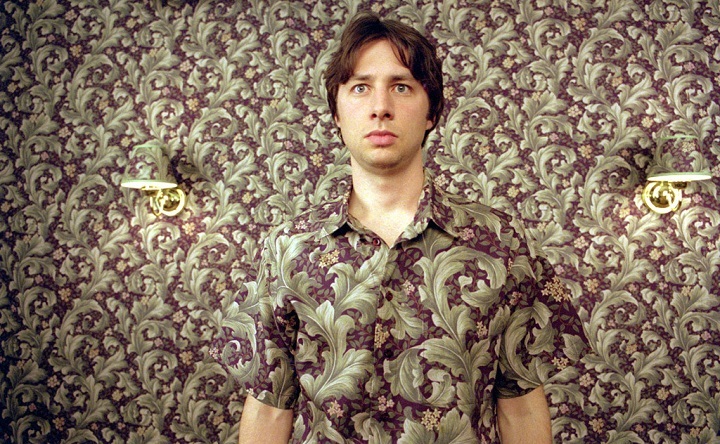 "Garden State" is a VERY good first step up the ladder for Zach Braff. Capturing the twenties with ease, Braff tells an engaging story which keeps the audience hooked from start to finish. With a stunning soundtrack and amazing characterisation, Braff makes us think and feel as his character of "Large" rediscovers himself. Admittedly Braff's one flaw is the slightly too "play it by numbers" finale which rounds itself off too nicely, but even then, we never loose interest. A wonderful first feature for Braff and a positive sign for the future.